With its bold styling and flamboyant aesthetic, this hotel embodies Parisian flair. Occupying a Hausmannian building on a quiet street, the hotel is the perfect retreat in the heart of the city, with the Garnier Opera and the famous Grands Magasins, Galleries Lafayette and Printemps, at your doorstep. Each of the 39 contemporary guest rooms is unique in its design; all offer a wealth of amenities for a relaxing and memorable stay. 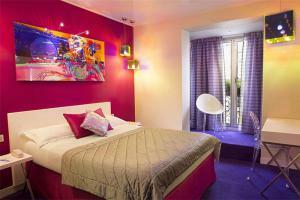 This hotel is about 12 miles from Charles de Gaulle Airport, and 11 miles from Orly Airport. Gare Garwalk. Gare du Nord is about half a mile away. The nearest Metro station is Cadet, about a quarter of a mile from the hotel.